Battle of the Crater, Alfred Waud, Harper's Weekly, 22 Aug. 1864, p. 548. By far the most famous and awe-inspiring battle of the Siege of Petersburg, the Battle of the Crater, occurred 147 years ago today. 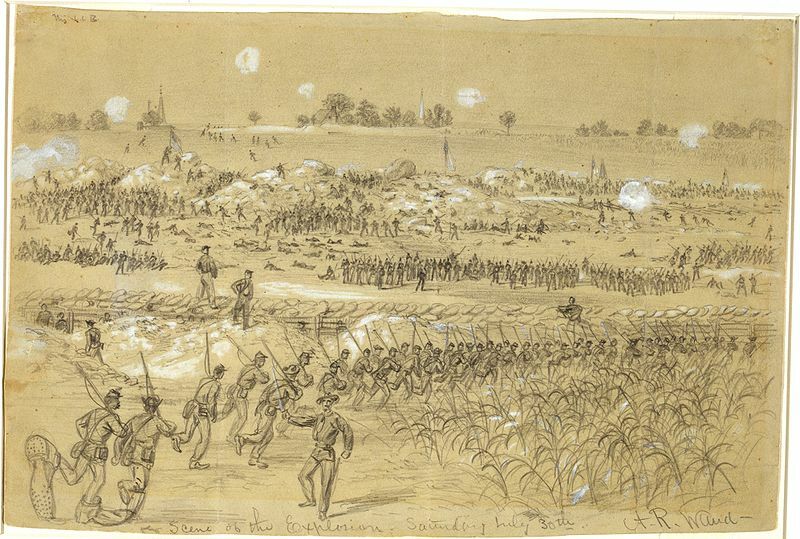 The Battle of the Crater featured the longest tunnel dug in siege operations in the entire American Civil War, a massive explosion which caused even battle hardened veterans to mull about dumbstruck for several minutes after, the first large scale use of African-American soldiers in the Petersburg Campaign and Confederate response to this, and what historian Earl Hess, among many others, believes was a massacre based on available evidence. The dreadful Union performance at the Battle of the Crater led directly to the courts-martial of both the luckless Ambrose Burnside and his cowardly division commander James Ledlie in the battle’s aftermath.